You'll have to add Games Workshop to the list Lama. I know they aren't well loved by some but the stuff they put out works great for what we need. Re: Soldiers of Valhalla-ready for nominations! The Soldiers of Valhalla is ready for nominations. Playability-Are the powers clear and understandable? Are its master stats appropriate? Unless this has been corrected, I vote NO to review DW10K. I'm not generally the type to nominate my own items, but I think in the case of customs it's going to be hard to get lots of nominations by other folks due to the vast number of threads out there. As such, I humbly put forward 'The Nightwalker' and his 'Bodaks' for nomination into the Soldiers of Valhalla. The unavailability of the figure leads me to have to vote NO to review as well for DW10K. OK it looks like a Thor II from Battletech...but if you try to find that figure in minature form...its almost impossible. I thought I would look up alternatives and offer them, but Mechwarrior miniature are sold out everywhere. I think that every figure that can hit the board needs to have an explicit point cost, so I vote NO to review the Nightwalker and Bodaks. Edit: With ZB's NO vote for krysto2002's Deathwalker 10000, it has recieved 3 NOs and is removed from the process. Last edited by Killometer; December 4th, 2010 at 02:15 PM. I have to agree; even the Rechets have a point cost. I like the concept but must vote NO to review The Nightwalker and Brodak because of one being a non-costed unit (it is hard to determine the balance of a figure that has no cost, even if its cost is "inherent" in another figure's cost). Thanks for the feedback guys, and I understand what you guys mean. The one thing I would ask however is try not to look at the Bodak as it's own figure...because it really isn't in the traditional sense. 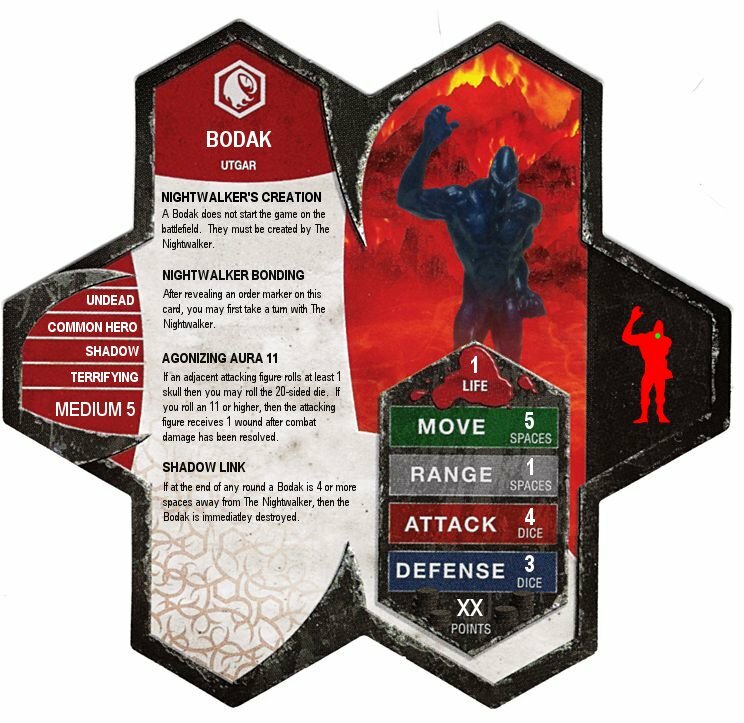 The Bodak is really a special power of the Nightwalker, and as such, was built directly into the points of The Nightwalker. Having to spend points on the Bodak's wouldn't really work as you never know how many you are going to have and it's largely dependant on the type of battle going on. There may be battles where it makes no sense to create a Bodak due to the tactics being used by your enemy (and the inherent risk in creating them). Regardless, you can never have more then 3, and I never found it to be overpowered. (at least not in my hands, hehe). Those decisions are what I was hoping would make the figure interesting to use as well as balanced. I 100% understand if this new mechanic will not work for you guys, just wondering if looking at it from a different perspective changes your thoughts at all? Last edited by Therrian; November 15th, 2010 at 01:56 PM. Sorry, but no (at least for me). I understood that they are "part" of the Nightwalker, but since they have their own card and their own figure(s), they need their own price, imo. Lamaclown's example of the Rechets is perfect-you have no idea if you'll get to use them, but you have to pay seperately for them anyways. They're a cool idea, but I'm not ready to break so far away from HS convention yet (Fanscape might take us there eventually, though ).